Hybrid architecture enabling GDPR compliance and scalability. This is a high-level look into the LTO Network hybrid architecture and public-private setup, with a short summary on how the token comes into play. For deeper understanding, refer to papers, dedicated company pages, and Developer Area. Most blockchain projects focus on financial transactions utilizing Smart Contracts. However, this leaves an enormous B2B market untapped. The benefits those parties are actually looking for in blockchain technology are reduction of costs on paperwork, administration, and so on. They need a way to automate processes — not within, but amongst organizations — in a trustless way. They need a level playing field. This is exactly what LTO Network provides. By combining private and public layers, it allows organizations to meet GDPR and data privacy requirements, while preventing the scalability issues typically associated with blockchain projects. 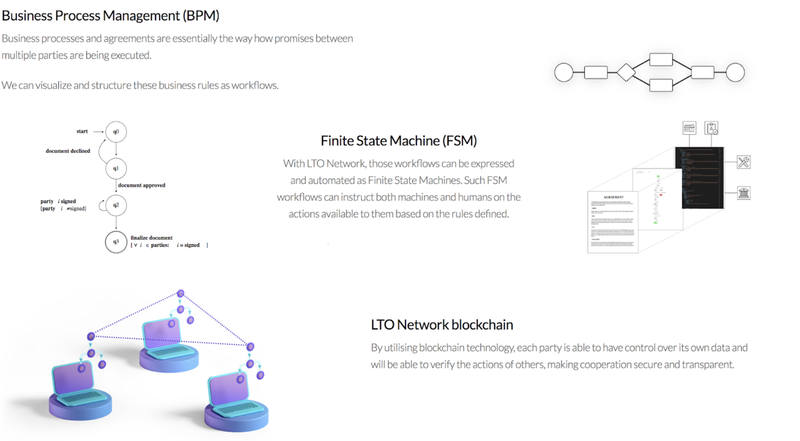 LTO Network’s infrastructure allows different parties, with competing economic and/or political interests, to work within the same processes without the need to trust one another or a third party. To facilitate this, LTO Network has developed Live Contracts. Similar to a Smart Contract, a Live Contract provides a dynamic method for defining logic on the blockchain. However, the purpose of a Live Contract is not just to determine the state of a process, but to actively instruct humans and computers about the steps it contains. In other words, a Live Contract is a workflow. A workflow is a sequence of related steps or processes that are necessary to complete a particular task. Think of it this way: a workflow has rules, where a certain action triggers another action, and so on. A workflow is essentially the general template of a business process. For example, consider the workflow of a simple lease agreement approval, in which a document gets (1) drafted, (2) approved and (3) signed. A process is the specific instance of this workflow, so for example the lease agreement between parties A and B, which was drafted by an employee of B, approved by the CEO of B, and signed by both parties. A workflow always contains certain logic: the rules mentioned before. Take for example the rule that signing can only come after approval, or that a rejection instead of an approval would lead to a re-draft of the agreement. 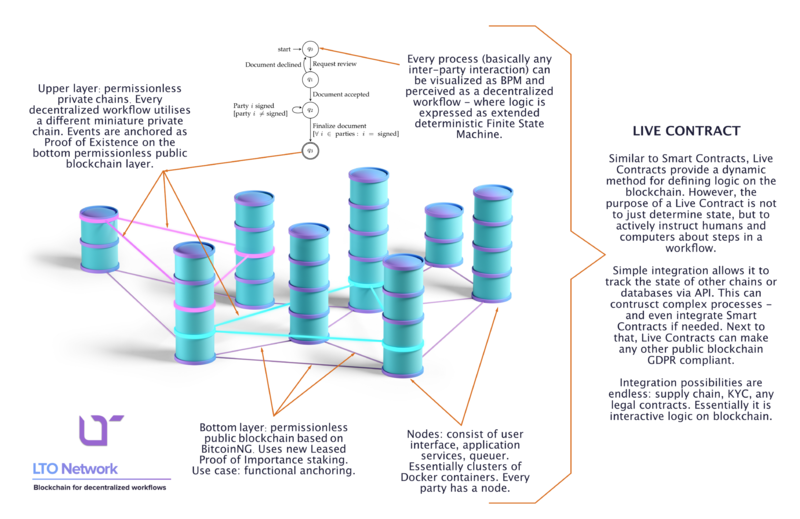 Essentially, LTO Network handles inter-party Business Process Management on the blockchain. Live Contracts can be applied in a broad spectrum of areas, for example in supply chain, insurance, healthcare and KYC procedures. Moreover, the system can be used for legal contracts like lease agreements and NDA contracts. Other use cases can be found here. What do we usually see in blockchain projects? A TPS race with an attempt to fit everything into one general purpose blockchain (usually referred to as layer 1). But do we really need to do this? We don’t think so. The technology should not be looked at in abstract. Every use case has its requirements. In short, the private layer is for data sharing, process automation, and collaboration. The public layer, on the other hand, acts as a security settlement layer, like an immutable digital notary for hashes of layer 2 (a distributed hash table, of sort). This hybrid approach makes LTO Network GDPR and data privacy compliant, as well as extremely scalable. Leased implies that you do not have to run a node yourself. Token holders can lease tokens to solution users (companies) directly or through a community ambassador node. This makes it possible for end users to not be directly involved with the token. This removes frictions related to corporate use of tokens. Importance skews the validator reward probability based not only on the size of your stake, but also your actual usage of the network. For active users of the network, this essentially means pay once — use forever. In other words: removing recurring infrastructure costs. It also helps avoid centralization that usually plagues Proof of Stake systems by discouraging passive staking.